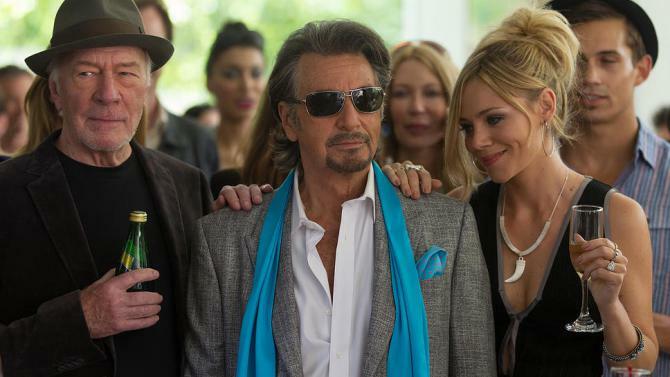 The chance to see Al Pacino back on the big screen is perhaps the best reason to see Danny Collins, the directorial debut from screenwriter Dan Fogelman. That is not to say the movie is bad per se, but nor is it anything that is likely to resonate after you leave the cinema. It is clichéd, sentimental and predictable, but there is some joy to be found in watching Pacino ham it up as the titular past-his-prime rock star who has a crisis of conscience after being gifted an artefact from his past. It is based very tenuously on a real life circumstance in which British folk singer Steve Tilston discovered a letter written to him by John Lennon some 34 years after the fact. In the film, when the letter from Lennon is presented to Collins as a birthday gift by his manager and best friend Frank (Christopher Plummer), it triggers a crisis of conscience that prompts Danny to make some significant changes in his life in a bid to reconnect with his family and rediscover his talents as a songwriter. You see, whilst Danny’s early success came courtesy of his own songs, much of his career has been spent rehashing his early work and performing songs written by others. Presenting as a cross between Rod Stewart and Neil Diamond – his biggest hit Hey, Baby Doll sounds remarkably like Diamond’s Sweet Caroline – , Collins has become a nostalgia act whose concert tours draw the same greying groupies who have followed him for decades but continue to fund a decadent lifestyle that includes nightly binges on cocaine and booze and a 20-something fiancé. However, upon receiving the Lennon letter, Danny quits his current tour and decamps to a Hilton Hotel in New Jersey in an effort to write new material and track down Tom (Bobby Cannavale), the son he has never met. Of course, the choice of location seems to be more about churning out those typical movie barbs about the region than anything else, with Frank lamenting on more than one occasion about having to visit New Jersey to see Danny. Tom is happily ensconced in suburbia with pregnant wife Samantha (Jennifer Garner) and young daughter Hope (Giselle Eisenberg), who apparently suffers from ADHD but actually seems like a typically boisterous primary schooler. When Danny’s initial overtures are rejected, he sets out to secure redemption with the only tools he has at his disposal; fame and money. Much drama ensues as Tom finds himself torn between his determination to forego his father’s generosity and the needs of his family. Whilst Cannavale is really good as a man who is beaten down and worn out from his efforts to support his family in the face of a potentially fatal illness, Garner finds herself in yet another role of little substance. Danny, meanwhile, between his efforts to ingratiate himself with Tom and write new material, also finds the time to flirt with hotel manager Mary (Annette Bening) in an effort to secure himself a more age-appropriate girlfriend. In fact, the repartee between Bening and Pacino is a lot of fun as she resists his every effort to woo her, despite an obvious attraction to the bonhomie she sees lurking beneath the surface of his more bombastic public persona. This is definitely not an exploration of the dark underbelly of the music business like the far superior Crazy Heart, and it seems likely that Fogelman was always aiming for a film with much broader appeal given his background as the writer of releases such as Guilt Trip, Last Vegas and Crazy, Stupid Love and Disney fare Tangled, Bolt and the two Cars movies. The role is hardly a challenge for Pacino and, whilst a quality story and script should always be the foundation on which any film is built, Fogelman has assembled a cast that have, to a certain extent, been able to overcome shortcomings in the writing. 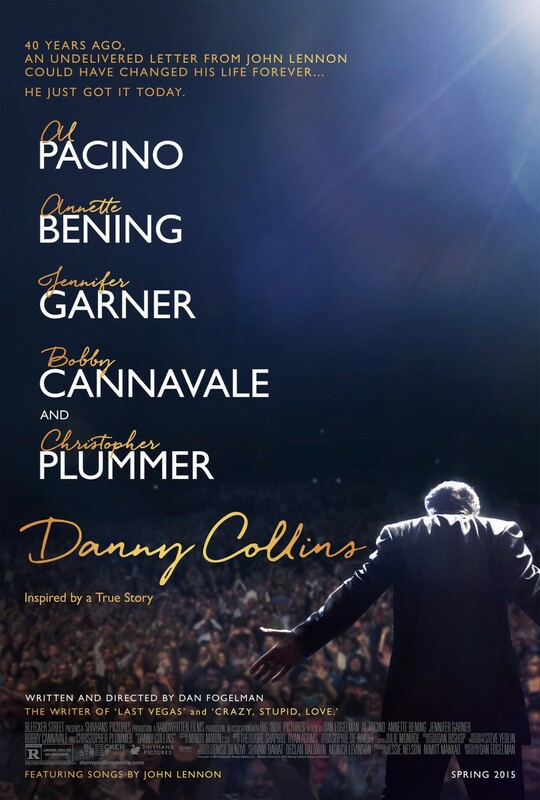 Yes, we know exactly how it will all pan out, but Pacino is a lot of fun (and looked like he was having a lot of fun) and the likes of Bening, Cannavale and Plummer offer solid support to save Danny Collins from swaying too much towards melodrama.